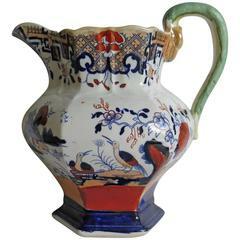 This is an unusual jug or pitcher made by Mason's ironstone pottery, circa 1830. It has a rare shape and pattern. A jug of the same shape and pattern is illustrated on Page 192, Plate 245 of Godden's guide to Mason's China and the ironstone wares, published by The Antique collectors club. The jug has a hexagonal form and ovoid shape with a high loop handle terminating in a dragon's head. 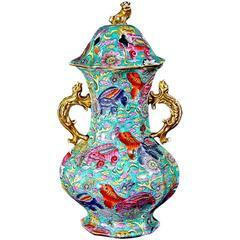 The jug is hand enameled with typical bold colors over an under-glaze printed, chinoiserie oriental/ Asian influenced, pattern Number "306". The base has a blue printed Mason's mark in blue, with Pattern No. 306 below. This mark dates the jug to the period 1825-1840. The jug is in very good condition with no damage. Very large antique Mason's ironstone pitcher. A large Mason's Ironstone Fenton shaped Staffordshire mazarine blue with gilt decoration jug or pitcher.